The True MicroChIP kit in combination with the MicroPlex Library Preparation™ kit allows for performing ChIP-seq on as few as 10,000 cells. This microChIP-seq assay has been validated with the new generation IP-Star® Compact Automated Workstation. Furthermore Diagenode's high quality ChIP-seq grade antibodies have been used. ChIP efficiency on 10,000 cells. ChIP was performed on human Hela cells using the Diagenode antibodies H3K4me3 (Cat. No. pAb-003-050), H3K27ac (pAb-174-050), H3K9me3 (pAb-056-050) and H3K27me3 (pAb-069-050). Sheared chromatin from 10,000 cells and 0.1 µg (H3K27ac), 0.25 µg (H3K4me3 and H3K27me3) or 0.5 µg (H3K9me3) of the antibody were used per IP. Corresponding amount of IgG was used as control. Quantitative PCR was performed with primers for corresponding positive and negative loci. Figure shows the recovery, expressed as a % of input (the relative amount of immunoprecipitated DNA compared to input DNA after qPCR analysis). A: ChIP has been peformed with H3K4me3 antibody, amplification of 17 pg of DNA ChIP'd from 10,000 cells and amplification of 35 pg of DNA ChIP'd from 100,000 cells (control experiment). The IP'd DNA was amplified and transformed into a sequencing-ready preparation for the Illumina plateform with the MicroPlex Library Preparation kit. 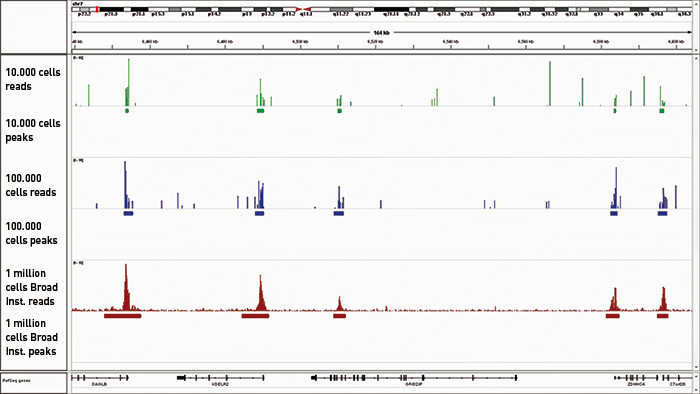 The library was then analysed on an Illumina® Genome Analyzer. Cluster generation and sequencing were performed according to the manufacturer's instructions. B: We observed a perfect match between the top 40% of True MicroChIP peaks and the reference dataset. Based on the NIH Encode project criterion, ChIP-seq results are considered reproducible between an original and reproduced dataset if the top 40% of peaks have at least an 80% overlap ratio with the compared dataset. Cell lysis was performed using the Lysis Buffer tL1 of the Diagenode True MicroChIP kit. Samples corresponding to 10,000 cells are sheared during 5 rounds of 5 cycles of 30 seconds “ON” / 30 seconds “OFF” with the Bioruptor® Plus combined with the Bioruptor® Water cooler (Cat No. BioAcc-cool) at HIGH power setting (position H). For optimal results, samples are vortexed before and after performing 5 sonication cycles, followed by a short centrifugation at 4°C. 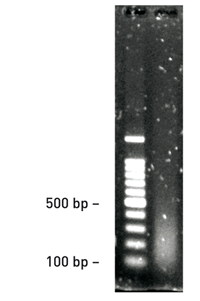 10 μl of DNA (equivalent to 60,000 cells) are analysed on a 1.5% agarose gel. Diagenode strongly recommends using this:	True MicroChIP Kit (Diagenode Cat# C01010130). Click here to copy to clipboard.